What follows is a totally non-biased opinion on my childhood home. A few months ago I wrote about Hazel Grove Carnival, which meant a lot to me because that’s the village I’m from! I’ve always lived here. I was born in Stepping Hill Hospital in Hazel Grove and none of the four times we’ve moved house since I was born has been a move out of Hazel Grove. It’s a sleepy little village made up of mostly an Asda, a Sainsbury’s, kebab shops and curry houses. Oh, and the main thing: pubs. Pubs make up the brunt of the grove, from the Rising Sun at the top near the bus stop to the George and the Dragon at the bottom near the hospital. But the best pub (bang in the middle next to the bank for easy access to money and a kebab shop on the other side for the end of your Saturday night) is The Horse and Jockey. Like I said to begin with, I lived in the Horse and Jockey for six years of my life. It’s changed considerably since I moved out but my fondness for the place is still there. It’s sort of a mashup shape with the poolroom at the back and scattered pillars keeping the whole place up. It’s small, and there’s nothing much of a beer garden – just a few benches and ashtrays out near the chippy bins – but it’s cosy. You can go there and the folks behind the bar already know what you want to drink. There’s always going to be someone you know stood at the bar, whether it’s a family member or just someone who basically is family by this point, or maybe even someone who’s known you since you were three years old but you’ve no clue who they are. There’s a big enough TV to crowd around and watch football, and not to mention live entertainment every night from karaoke to a dude with a guitar softly singing to you. The Horse and Jockey, to me, embodies everything that Hazel Grove is and will ever be. Sleepy and comfy and a little bit mad – full of good people, kebab shops and laughter. 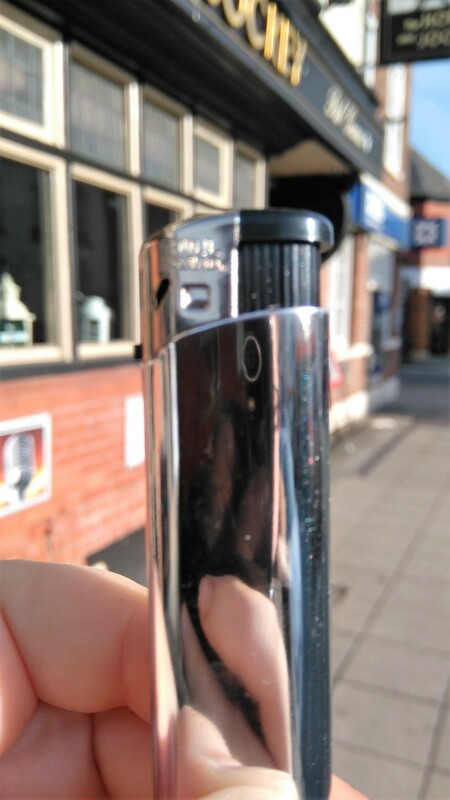 My lighter is from behind the bar. It cost me 99p, which is only £1.41 less than a pint. I never feel at home until I’ve had one in the Jockey, the best pub in the north.